Welcome to the Great War (WWI) Time/Area!!! As usual, it has been a while between updates, but it is time for this T/A to get a face-lift... look for it soon. And, if you have any suggestions, pictures, ideas, or cool recipes, please let us know so that we can place them somewhere on this site. This WWI time/area is run by Marcus Strehl and Nick Bakris. If you have any good web sites for us to list, want a unit link or have a good book you've read, send this info too—visit our "Wanna Link" page for more info. Welcome To World War One—"The Great War"
Welcome to a fascinating new era known as The Great War. If your interests extend into the recreation of this period in our history, we can assure you that you will not be disappointed. 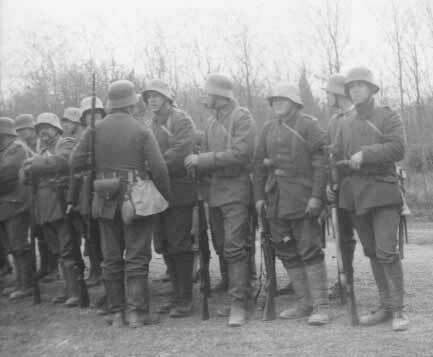 We offer a unique and exciting type of "recreation" that compares to no other, in fact, all other forms of "reenacting will seem dull after a weekend "in the trenches." World War I (or the "Great War" as it was called by those who fought in it) saw war at its unbelievable worst. Death was a constant companion stalking through the trenches, as it never had before. Life for the soldiers took on new horrors, the kind that only trench warfare can produce. There had never been anything like it before and there won't ever be anything like it again--WWI stands alone in history as man's greatest cruelty to his fellow man--each day reaching new heights of madness. Gains were measured in yards, at a cost in lives that is still unresolved to this day. 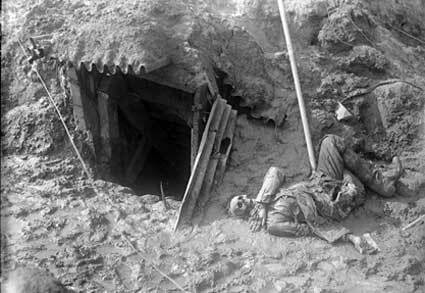 Casualties were rounded-off to the hundreds of thousands as men were swallowed up in the hell of the trenches. A whole generation of men was lost forever, and in certain towns throughout England and France, the flower of youthful manhood was entirely erased, slaughtered in rows by the latest German weapon, the Maxim machinegun. Those men who weren't killed on the battlefield, had their lives irretrievably shattered. Places like Verdun and the Somme taught a need for new tactics, as both sides settled down to the stalemate of trench warfare. The soldiers experienced new and unheard-of horrors such as week-long artillery bombardments and poison--not to mention the "normal" old horrors of war such as rats, disease, mud, constant terror, and mutilation beyond comprehension, all of which left an impression that few can relate to in our modern "civilized" world. Ask most students today about the First World War and they will only give you a blank stare. Very few Americans can even tell you what years WWI was fought during; let alone what the November 11th holiday means! The veterans of the Great War are almost all gone now and the few of us who had the honor of knowing them, have been left with a curiosity and reverence toward those soldiers which has demanded a more in-depth exploration into "their" world. What was it like to live and fight in the trenches? Was it really THAT bad? Quite simply, YES--IT WAS! The accurate recreation of such an era of warfare has been no simple task, but on small battlefields around the United States (around the world, in fact) reenactors have created the closest thing possible. These battlefields have trenches, bunkers and yes, real barbed wire. There are grenades and working mortars, as well as machine guns and full-scale over-the-top assaults. Nighttime is punctuated by trench raids carried out under the eerie light of flares and star shells. In the adjacent trench bay, there is the sound of a hand-to-hand struggle, as each side battles for possession of the trench, with the victor usually being driven back by a reorganized counter-attack. In "no-man's-land," the quiet of a shell hole is interrupted by a form in the dark, which could be an enemy or it could be a friend--thinking it is not the enemy can result in a grenade in your lap. After the fight, you scurry back to your trenches, but even this can put you into a nasty barbed wire entanglement if you are unaware of the "safe" paths or draw a hail of fire for having forgotten the "password." You tumble back into the safety of your own lines and collapse on the muddy firing step to try and get a gulp of air, catch your breath and then a long drink of water. Hopefully, the enemy won't drop a mortar shell on your head tonight, or decide to gas your line--thus forcing you to don your stuffy and uncomfortable gas mask, that is also impossible to even see out of, let alone fight in it. If this kind of madness appeals to you, if it makes you curious, then you might want to consider reenacting the Great War. It's all there for you to experience, and what you get out of Great War reenacting is directly determined by what you put into it. You can live for days in a bunker without the modern world intruding--living like they did, without a bath or comfy bed to sleep in. You can get drenched to the skin, muddy all over, and still fight to hold or retake a section of the line, during a downpour. You will throw grenades into an enemy trench, take part in all-out assaults on the enemy's line and then face the thrill of repelling a mass of men swarming over your barbed wire into your trenches. Experience being part of a raiding party and storming the enemy's trenches. Or, if you're careless, you might have your throat cut by a silent raider while strolling through your own rear lines. You can be a machine-gunner, a mortarman, or just a grunt--it's all up to you and your involvement in the hobby. One thing we can promise you is that by the end of the event, you will be totally exhausted, as you never have before. And... you will find muscles in your body that you never knew were there. You will also acquire a new outlook on the term "re-creation" as opposed to "reenactment." Our goal is to accurately portray the common infantryman of the Great War. We accomplish this by accurately recreating his appearance, but we also carefully research and demonstrate the details of his life, duties and occasional pastimes at the front. From the moment you arrive at an event you will be submerged in the Great War. From the clothing you wear, to the food you eat, to the trenches you fight in; nothing is out of place! WWI truly is: "The "Reenactors Reenactment!" 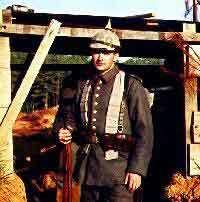 On this site, you will find some links to get you started on the path to reenacting WWI. 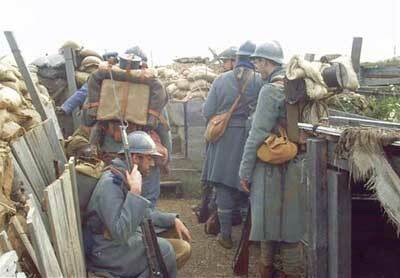 These sites all have good links pages to help you find out more about WWI and reenacting it. so bear with us and keep coming back! WWI Photo Album--This is a page of thumbnail photos from recent Great War reenactment events. We now have a WHOLE page of WWI Morsel articles. Click HERE to go there. These little articles cover topics on how to better your impression or just little bits of knowledge about the impression. As time goes on, we hope to really make this a good resource for reenactors. Questions or comments about WWI reenacting? Please, e-mail Marcus Strehl and Nick Bakris. Militaria Magazine -- One of the very best publications World-WIDE, Militaria specializes in... Militaria! Every magazine is chock full of colour photos of uniforms and kit along with with excellent high quality articles explaining everything. Militaria covers everything to do with the military and militaria during the 20th Century. NO -- reenactor should be without Militaria--Get a subscription today.